If the inmate in question has been transported to prison, the inmate will have the opportunity to have their property picked up by a designated person. This will only occur after the inmate has left our facility. If the inmate has left our facility, for permanent placement elsewhere, their property will go with them at time of transfer. In situations requiring a demonstrated need, an inmate may request permission to the Housing Sergeant to have personal property released to a specified person that is not incarcerated. If this request is approved by the Sergeant and you are the person that the inmate has specified to pick up the property, you will be contacted to arrange a time to come to the Sheriff’s Office to get that property. All personal mail is subject to search. Subjects in pictures must be fully clothed. All books must be shipped from the publisher or directly from Amazon.com. No third party book sellers are allowed. **Please include a return address. All money received will be placed into the inmate's account. Upon their release, all monies remaining will be released with the inmate. While in the Black Hawk County Jail, inmates are entitled to reasonable contact with their families and friends, unless this privilege has been restricted by disciplinary sanctions for a specified period of time. Each inmate can receive one visit per day for 30 minutes. General Population visitation (pods B, C, D, E, F) are Monday-Friday (excluding holidays) from 8:30AM - 10:30AM and 12:30PM - 2:00PM (every 30 minutes). There is also visitation on Monday and Wednesday night at 7:00PM and 7:30PM. Visitors need to be signed in no later than 10 minutes prior to the start of the next visitation (30 minute) session. Space is limited, expect delays when visiting an inmate. 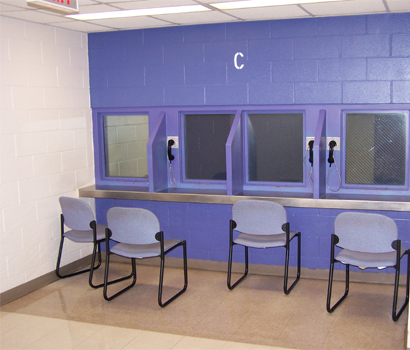 Visitors are expected to adhere to policies and procedures of the Jail. * The Black Hawk County Sheriff's Office reserves the right to refuse visitor access. * Children accompanying visitors may not be left unattended for any reason. Visitors who violate these rules may be restricted, and possibly banned from visiting any inmate in the future. Information in regards to room and boarding fees at the BHC Jail. Payments can be brought in or mailed to the Sheriff's Office. To post a cash bond, first verify with the Jail the amount of bond by calling 291-2587 ext. 5244 or checking this website. During regular business hours take the cash and go to the Black Hawk County Courthouse, 3rd floor, and present the cash to the Clerk of Courts. A certificate will be given to you verifying the bond is paid. Bring that certificate to the front counter of the Sheriff's Office and give it to the attendant. After regular business hours, bring the correct cash amount directly to the BHC Sheriff's Office. To post bond utilizing a bonding agency, you need to contact one of the various agencies in the area. The phone numbers for the agencies can be found in the phone book. The bonding agencies will work with you and come up with the terms and conditions of posting bond for an inmate's release. The bonding agencies are completely separate from the Black Hawk County Sheriff's Office, and the Sheriff's Office does not recommend or discredit any bonding agency. Set up a Phone Account? If you have problems with an existing account, call 1-877-550-4249.